At 25 days old, the chicks continue to make good progress, despite some concerns that one seemed to be lethargic and suffering a lump in the throat. They’ve all three been feeding well today, with another Feral Pigeon brought in by the male. 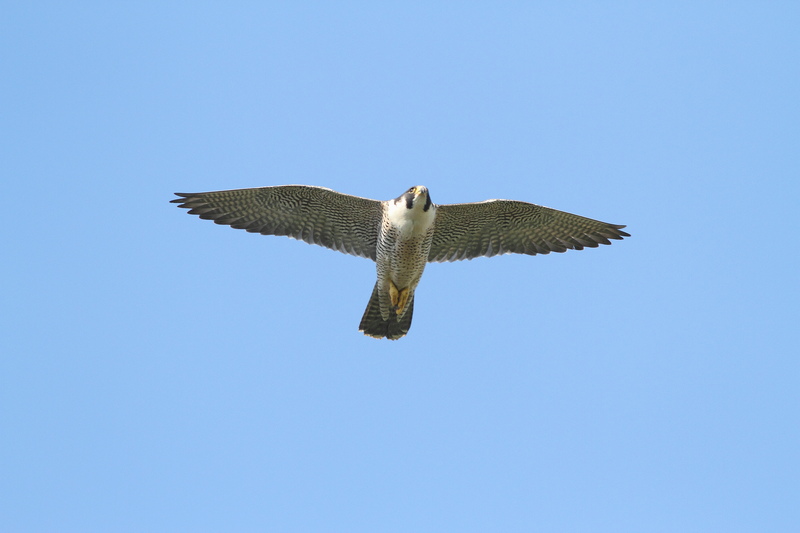 They are starting to change quickly in appearance as the down is lost and feathers become increasingly visible, especially when a bit of wing stretching takes place, as below. Over the next week they’ll undergo a transformation and look almost ready to leave the nest. They’re also taking ever more interest in the world beyond the nest platform, spending periods looking out over the edge. At one point this afternoon the chicks starting to call very loudly, all panning their heads to follow something flying past. Whether this was one of the parents, or a Crow, or some other potential threat (Buzzards and Red Kites were seen over here last spring!) we’ll never know, but they were certainly alert to it. 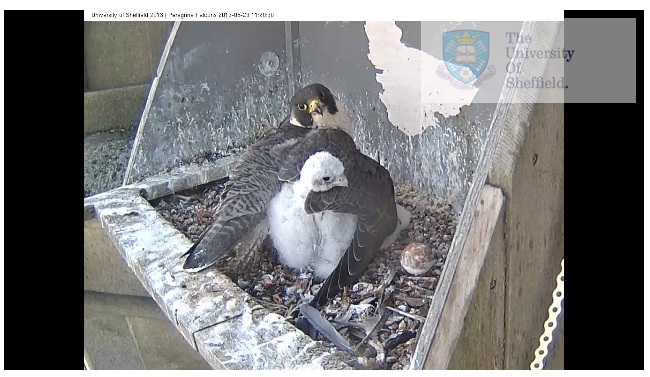 A few people have been concerned that the chicks are being left vulnerable to predation, but one or both adults are almost constantly on the church, even if not in view on the webcam. 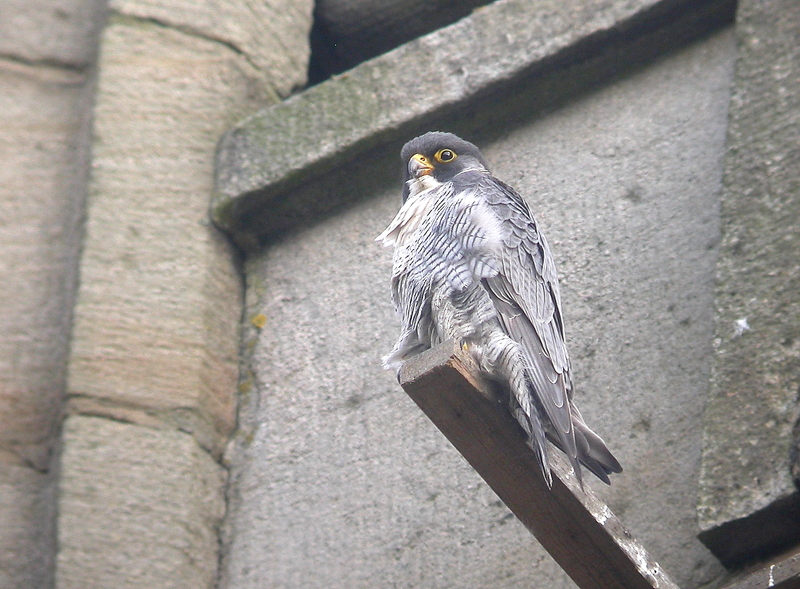 A visit for an hour on Bank Holiday Monday morning saw the female on top of the platform and the male on the corner of the church, though neither was visible on the webcam. Needless to say, they gave some great views and photo opportunities. From below it wasn’t possible to see the chicks at any point, but this will change and they will surely have been visible when on the edge of the platform posing for the photo above. The similarity in size between the chicks makes it pretty clear that they’re all females, and given their considerable size now the adults have given up any attempt to brood them – they’re almost the size of the male! Instead they huddle together for warmth in the continuing unseasonal weather and often flatten themselves against the floor of the platform if they’re not in the corner trying to keep out of the wind. This weekend should provide good views from below if the weather makes a visit tempting, and there will be a chance to watch them before and after the talk on Monday evening. Hope a good number of interested folk are able to make that, and a week from now the chicks will be a month old, about the age when the first flights become a possibility. We’re pleased to announce the following free event. St George’s Church, Mappin St, Sheffield, Mon Jun 3rd, 7-8pm. 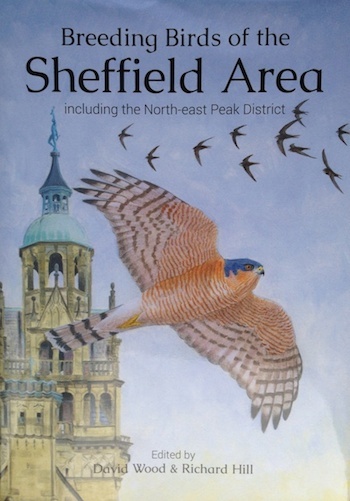 For their second year, Peregrine Falcons have nested on St George’s Church in urban Sheffield. 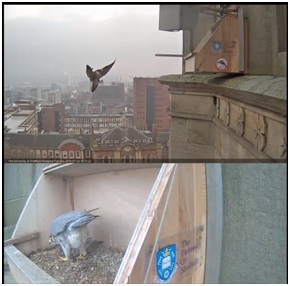 This public talk will see speakers David Wood (Sheffield Bird Study Group) and Phil Riley & Jim Lonsdale (The University of Sheffield) talk about the history of the Peregrines, the construction and siting of the nest platform, and developments around the webcam. After the talk there will be a chance to ask questions, and to view the birds from below. A University of Sheffield news release about the event can be found here. (Please note you can also find this event on Facebook). 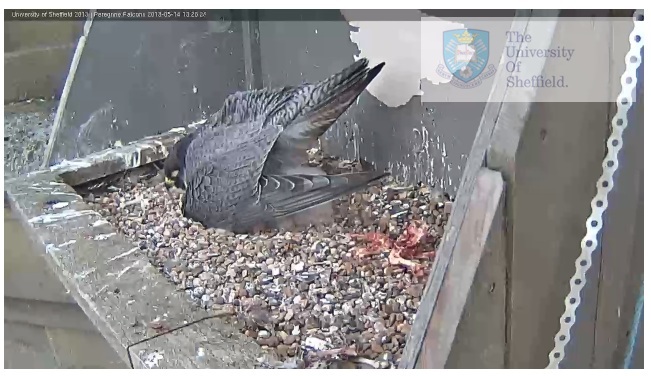 And what will those Peregrines do then, poor things? With a stiff northerly blowing straight into the nest platform, and an air temperature (without windchill factored in) down to 4 degrees, today was the day to find out exactly what they’d do. Despite the size of the three chicks, which continue to thrive, the adults spent most of the day brooding them as best they could to keep the cold off them. In the process they showed that it isn’t just Robins that might use their wing to keep warm. This was truly amazing to witness, and another behaviour that would have gone unseen without the wonders of the webcam. One chick was under the male’s breast, but the other two were both under the extended wing, at least until one wanted to have a look around. With these three to care for, the fourth egg is very much forgotten by the adults, although the chicks find it to be an interesting plaything from time to time. The chicks are starting to spread their wings and exercise those flight muscles that will come into play in a few weeks’ time. At the same time, the feathers are poking through the down, especially obvious in the tail and wingtips. Later this afternoon, the weather took a turn for the (even) worse and a heavy shower of sleet passed through, driving the chicks back under the male, on hand to provide shelter. The flakes can just about be seen in the picture below, in the air and on the male’s back. One of the surprises – to me at least – has been to see how much time the male has spent brooding and feeding the chicks, taking what seems to be a pretty equal share of the duties on the nest platform. 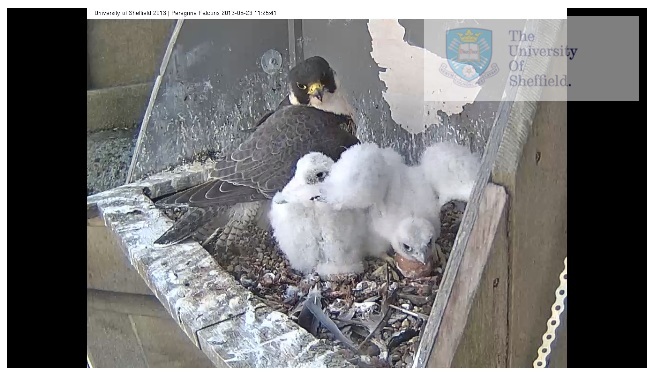 Another couple of weeks will see the chicks getting ready to take their first tentative flights, but enjoy the fantastic opportunities to watch their activities until then. 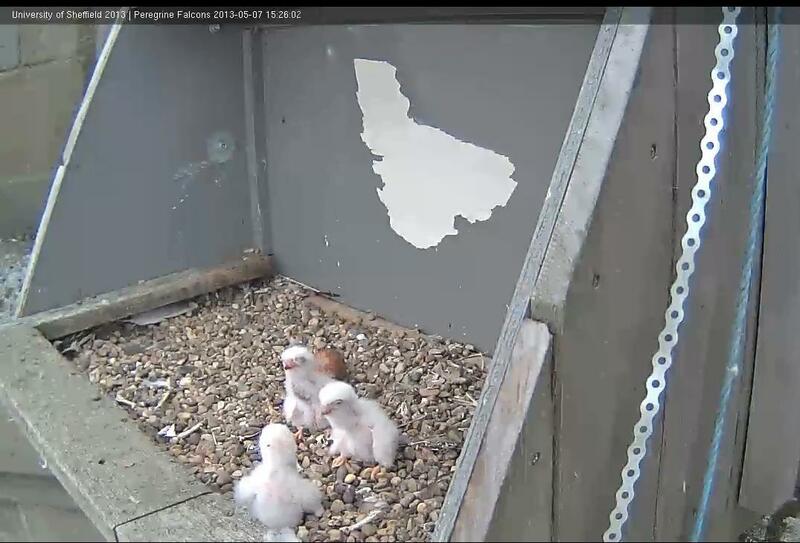 Ten days since the first chicks hatched, things are progressing well for the three eyasses (a term sometimes used explicitly for downy chicks taken from the nest for training in falconry, which won’t be happening in this case!). Both parents continue to feed them regularly, and while there does seem to be a pecking order, there’s plenty of food to go round, with Woodpigeon and Starling both identified today as prey items. Both adults are heavily involved in the feeding, with the male often reluctant to move off the nest to allow the female to take over. One or other of the adults is almost constantly on the platform, providing good warmth in the decidedly unseasonal weather. 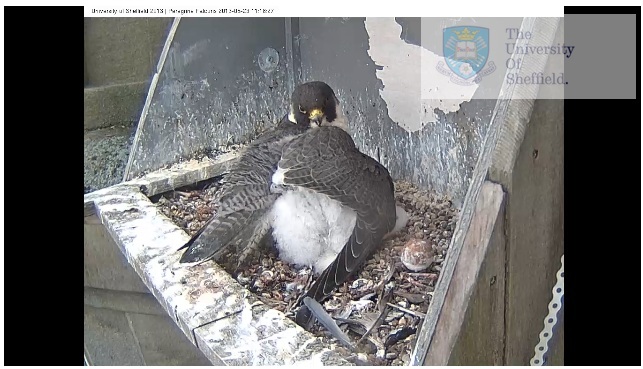 As can be appreciated in the picture above, the male in particular is now struggling to cover the chicks, and looks to be snoozing very uncomfortably! The female is more able to brood the rapidly growing chicks, but the male is more typically in a pose like that above, in which the fourth egg is also visible. As the chicks have grown the egg has been increasingly pushed aside, quite literally, despite the adults’ attempts at times to pull it under their body to incubate. However, over the last couple of days, the egg has been ignored as the focus falls entirely on raising the three chicks that did hatch. 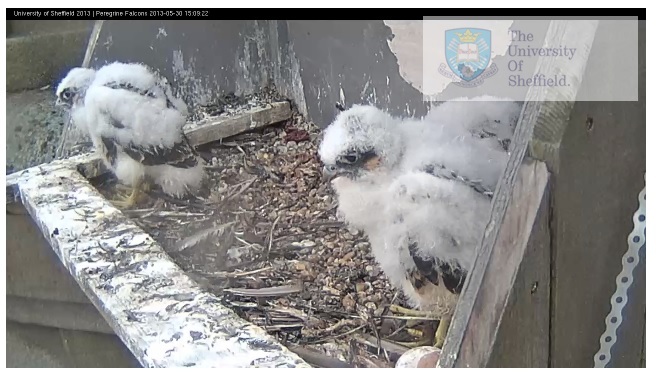 It’s been amazing to see how quickly they have grown over the last week and there are the first signs of feathers starting to poke through the down, just about visible as darker tips in the photo below. Clearly the chicks aren’t as excited about the whole process as those of us who are watching them! Four days on from the hatching of the first eggs, there’s no sign of the fourth egg following suit, and it’s looking almost certain that three chicks will be the final brood size. 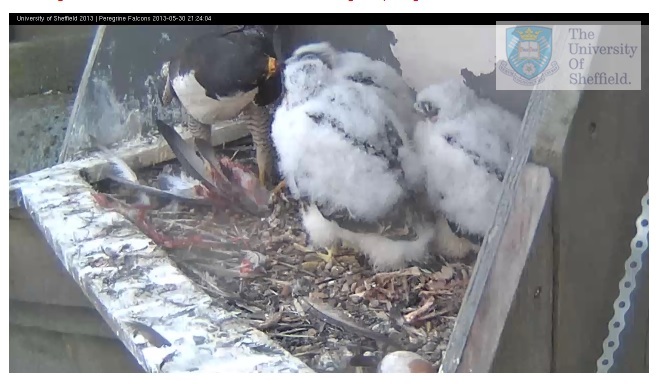 This would be quite normal, if a little disappointing, and was exactly what happened last year, when three of four eggs hatched, with two of the chicks going on to fledge successfully. What happened to the third chick will never be known, though there are several possible explanations: it may have perished in poor weather in the early stages of growth, or may have received less food than the others if it hatched later or was weaker. 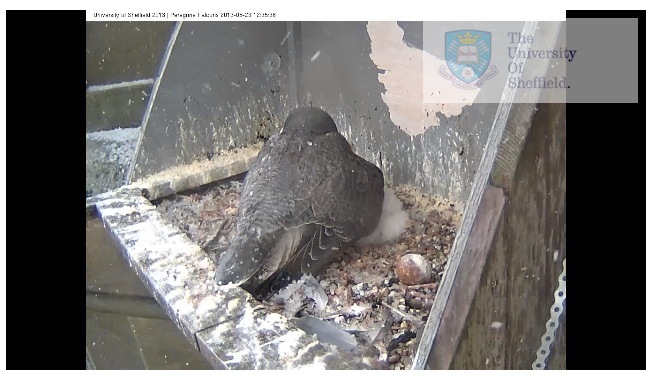 The fourth egg is still apparently being incubated, and the adults have been turning it as they pull it under their breast, but is also often being pushed out from under the adult as the chicks grow. 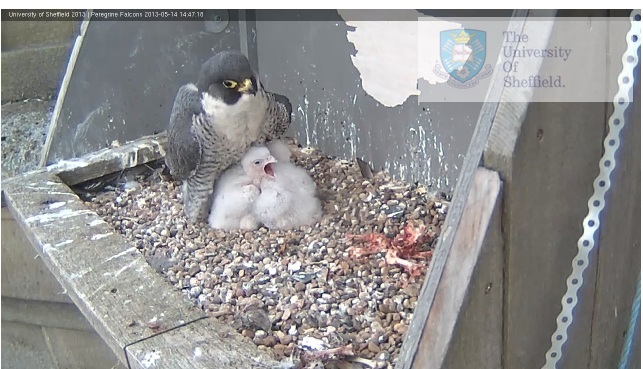 Some interesting behaviour was noted recently as the chicks moved towards the front edge of the nest platform when being fed, as can be seen in the picture below. 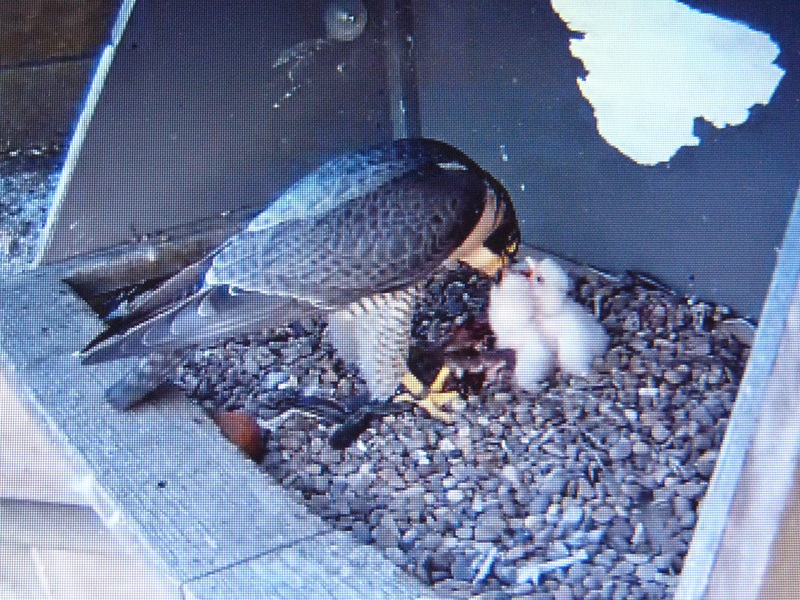 The female returned a couple of minutes later and moved the chicks back towards the rear of the platform. How tender and caring you might think, but the moving was done by picking each chick up by a wing or the back of the neck, so certainly caring but less than tender. The chicks seem to be made of tough stuff, and the coming days of wet and windy weather will test that, with the female offering a very effective umbrella for most of the afternoon today. The non-sitting adult is often around the church tower at present, and a few people have been enjoying the good views and photo opportunities that are on offer, so a visit in person is definitely worthwhile. The hoped-for hatching of the fourth egg did not materialise over the course of the day, though it could still happen. 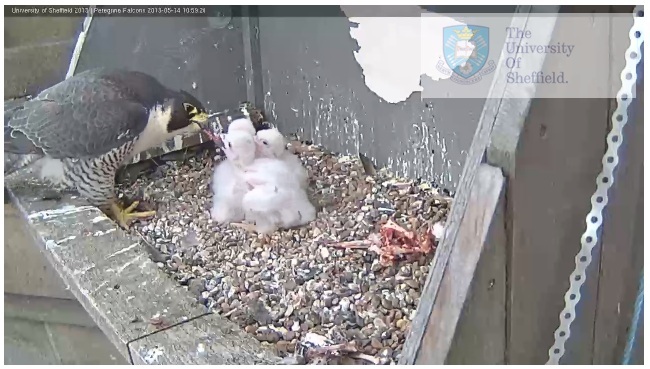 The three chicks that have hatched appear to be thriving, enjoying lengthy feeds at several points, the male again taking a very active role in feeding. 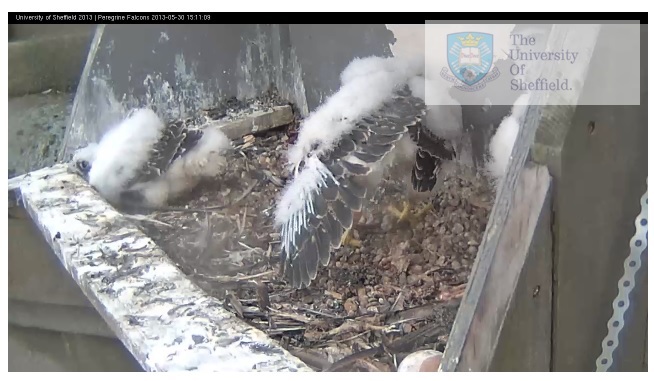 At the other end, the chicks have ‘vented’ on several occasions, showing fully functioning digestive systems! Once they get a bit bigger and more mobile, this tends to clear the nest platform, but for now it’s making a bit of a mess. Along with the bones this must be starting to make quite an odour, and a few flies have been buzzing around, providing a bit of comedy as the sitting adult follows a fly around the platform. It also shows their vision isn’t just great at distance. 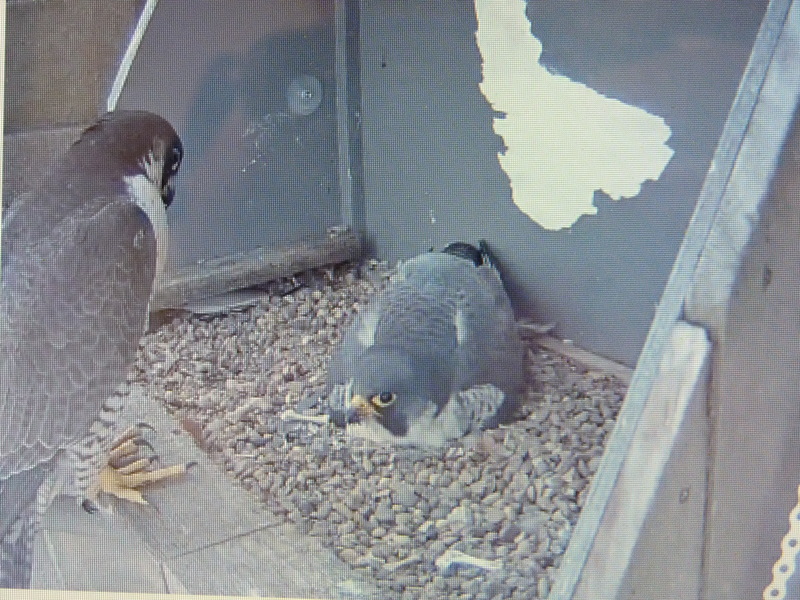 There’s also been extensive brooding of the chicks, serving the dual purpose of continuing to incubate the egg. 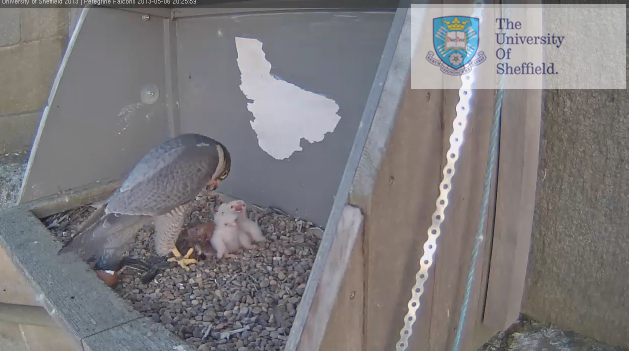 One growing concern is that even if the final egg does hatch, the chick is going to be quite a bit smaller than the others, although the third chick now seems pretty indistinguishable in terms of size, so perhaps a catch-up is still possible. As dusk falls the webcam, which has shown consistently excellent images, has just switched from normal to night vision, which was very psychedelic for a few seconds! The chicks look to be safely tucked away for the night, and they’ll need to be ready to benefit from that warmth over the coming days as the weather looks set to turn for the worse. Third chick hatched this morning, which leaves one egg being incubated, and the chicks spending most of the time also being brooded under whichever adult is on the nest. Both the male and the female have been taking turns to brood – the female clearly bigger, slightly more grey than blue (she’s a slightly darker grey see the difference between the two adults in the picture below, in which it’s the male that’s incubating) and more obvious buff tips to the tail feathers, while the male is ringed on the right leg. The chicks all had a good feed at about 10 am, the male tearing chunks off a prey item brought to the nest and giving them to the chicks. A little later he was none too keen to hand over incubation duties when the female came onto the edge of the nest platform and great to see both adults and the chicks on the platform together. 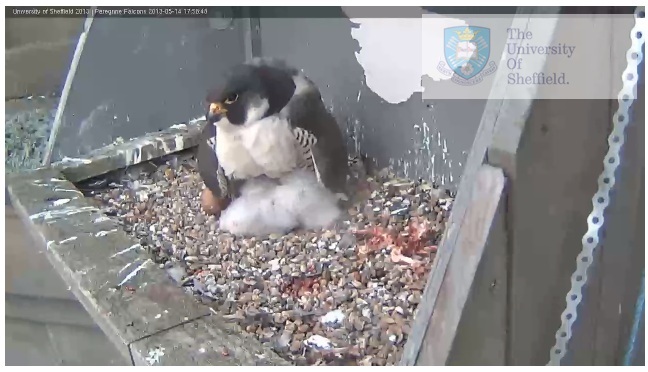 Fingers crossed the fourth egg hatches before the end of the day, or perhaps early tomorrow morning, and plenty to look forward to in the days ahead as things hopefully become established. By late evening still three chicks and one unhatched egg. 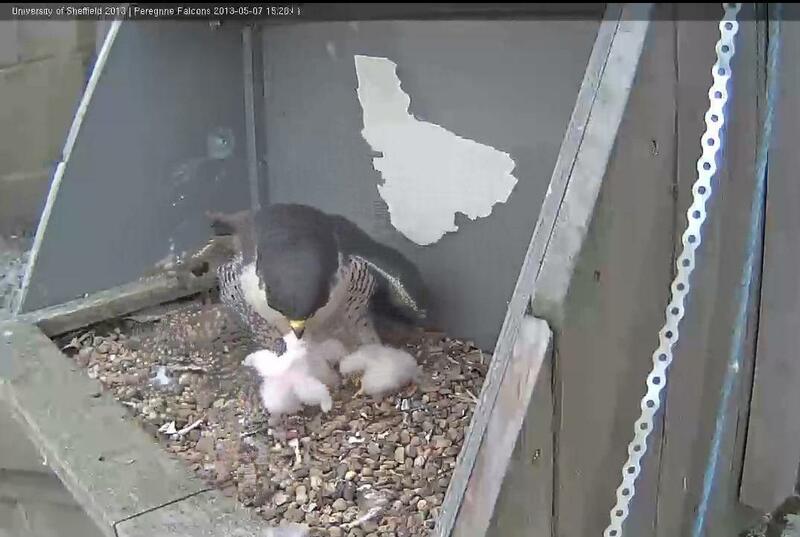 The chicks had an extended feed around 20:30, with one of them enjoying the lion’s share. 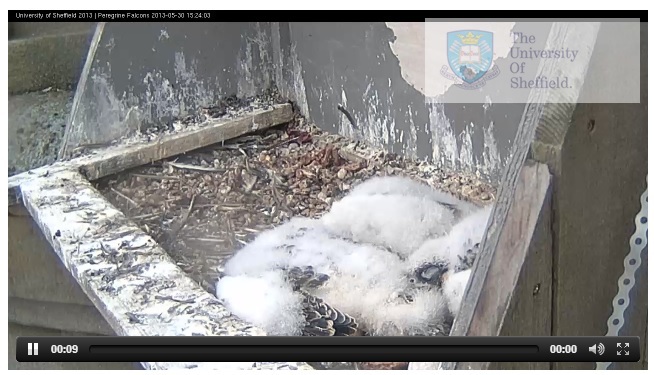 All now being brooded through the night by the female.